1. Flexibility – The second a company needs more bandwidth than usual, a cloud-based service can instantly meet the demand because of the vast capacity of the service’s remote servers. In fact, this flexibility is so crucial that 65% of respondents to an Information Week survey said “the ability to quickly meet business demands” was an important reason to move to cloud computing. 2. Disaster recovery – When companies start relying on cloud-based services, they no longer need complex disaster recovery plans. Cloud computing providers take care of most issues, and they do it faster. Aberdeen Group found that businesses which used the cloud were able to resolve issues in an average of 2.1 hours, nearly four times faster than businesses that didn’t use the cloud (8 hours). The same study found that mid-sized businesses had the best recovery times of all, taking almost half the time of larger companies to recover. 3. Automatic software updates – In 2010, UK companies spent 18 working days per month managing on-site security alone. But cloud computing suppliers do the server maintenance – including security updates – themselves, freeing up their customers’ time and resources for other tasks. 4. 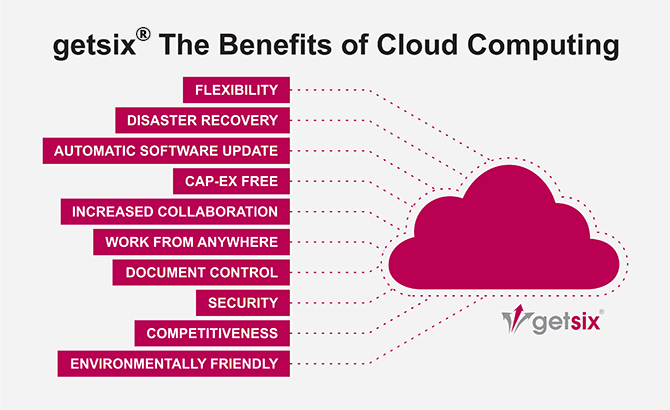 Cap-Ex Free – Cloud computing services are typically pay as you go, so there’s no need for capital expenditure at all. And because cloud computing is much faster to deploy, businesses have minimal project start-up costs and predictable ongoing operating expenses. 5. Increased collaboration – Cloud computing increases collaboration by allowing all employees – wherever they are – to sync up and work on documents and shared apps simultaneously, and follow colleagues and records to receive critical updates in real time. A survey by Frost & Sullivan found that companies which invested in collaboration technology had a 400% return on investment. 6. Work from anywhere – As long as employees have internet access, they can work from anywhere. This flexibility positively affects knowledge workers’ work-life balance and productivity. One study found that 42% of working adults would give up some of their salary if they could telecommute, and on average they would take a 6% paycut. 7. Document control – According to one study, “73% of knowledge workers collaborate with people in different time zones and regions at least monthly”. If a company doesn’t use the cloud, workers have to send files back and forth over email, meaning only one person can work on a file at a time and the same document has tonnes of names and formats. 8. Security – Some 800,000 laptops are lost each year in airports alone. This can have some serious monetary implications, but when everything is stored in the cloud, data can still be accessed no matter what happens to a machine. 9. Competitiveness – The cloud grants SMEs access to enterprise-class technology. It also allows smaller businesses to act faster than big, established competitors. A study on disaster recovery eventually concluded that companies that didn’t use the cloud had to rely on tape backup methods and complicated procedures to recover – slow, laborious things which cloud users simply don’t use, allowing David to once again out-manoeuvre Goliath. 10. Environmentally friendly – Businesses using cloud computing only use the server space they need, which decreases their carbon footprint. Using the cloud results in at least 30% less energy consumption and carbon emissions than using on-site servers. And again, SMEs get the most benefit: for small companies, the cut in energy use and carbon emissions is likely to be 90%. What is a Hosted Application versus a SaaS application? The table below describes some of the characteristics which differentiate a SaaS offering from a hosted offerings.